Importantly, something that we love about Costa Rica destination weddings is the adventure and natural beauty that you just can’t find in other locations. Costa Rica is in the heart of Central America and is small enough to have the feeling of seclusion. Furthermore, Costa Rica may be the perfect destination that you have been looking for, especially for somewhere unique. So, imagine yourself surrounded by rainforests, beaches, and waterfalls like you have never seen them before. We are ready to help you plan your dream destination wedding wherever you want it. We highly recommend beautiful resorts in these cities and regions of Guanacaste and Nicoya Peninsula, let us tell you more about them below. Moreover, when it comes to Guanacaste and Nicoya Peninsula, the Surf is where the heart is. If you are looking for stunning beaches, fun water sports that include diving, fishing, windsurfing and snorkeling, and amazing sights, this could be the place for you. We have plenty of options when it comes to resorts in this area. You can start exploring them if you want to get started, these are just a few to get the ball rolling, but we can book other resorts. Once we sit down and speak with you and understand what you want, we will be able to direct the exact resorts for you. Get ready for Costa Rica destination weddings to blow you away. 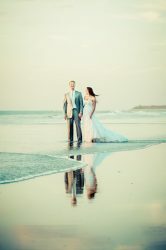 Costa Rica destination weddings aren’t as simple to book as other destinations. The resorts, flights, and wedding packages can be a complicated task for the wedding planning. We are here to help. When you book with Liz Moore Destination Weddings, you are getting the best. Also, we’ve been to Costa Rica, we’ve stayed at the resorts, and we’ve engaged in the activities. We want to listen to you and your needs to book the resort you’ve always wanted for your dream wedding. Finally, once we have found the resort, we secure your wedding date, book the accommodation, and ensure plenty of flight options for all of your friends and relatives. We want to find you the best deals and save you money where we can. Tell us your budget, and we will work with you to meet it. Best of all, our services are entirely complimentary. We got into this business to provide and personalized service that would help couples combine their weddings with adventure and travel. Ultimately, let us help you plan the trip of a lifetime to celebrate the love between you and your partner.